Only kindness can free a heart held hostage by hate. Antonio Albóndiga is sent to Sardinia after mishaps in his homeland, and is eventually banished to the village of Orune. Half the villagers—including Sarda and Shardana—follow a pre-Christian religion, while the other half observe a makeshift version of Catholicism and paganism. Hate holds the priest's heart hostage, and he scorns Sarda and Shardana's adherence to ancient ways. Despite their suspicions, the healers and their village attempt not only to accept the stranger but to transform him. shepherd cottages, unleavened bread, pungent pecorino cheeses, native distilled spirits, honey, wild flowers, and mountain air....The subtitle of the book, " a love story,"
not purely a historical fiction, definitely not a bodice ripper of the romance genre. merely from reading the descriptions of time spent in the forests and amidst the vegetation, and from the depiction of tolerance for the unfolding of human behaviors." "Thank you for writing this book. I loved the way you created space for grief! Your characters are so real. I do not want to finish this book." "This engaging and beautifully written novel made me want to ditch my current busy life for the simplicity and connectedness of life in Orune, Sardinia. I loved how she deftly described the nuances of each of the major players in this inspiring and compelling story. What a perfect description of how love, compassion and collaboration can heal the deepest of wounds. And I want to find an oak tree of me own..."
"Heretics: A Love Story belongs in the highest echelon of classic literary fiction insofar as it educates and enlightens while entertaining the reader....Mary Saracino combines acute psychological acumen with extensive knowledge of history to create a novel that will engross your mind, grip your heart and inspire your soul." 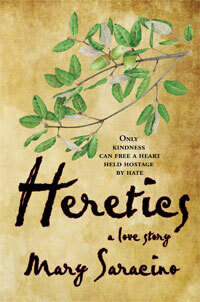 "Heretics: A Love Story reminds me of Grazia DeLedda's Canne al Vento, a book by the Sardinian Nobel Prize winner who first brought the Barbagia to the world's attention in 1926. The stellar aspect of Saracino's novel is that she incorporates all the Afrocentrist research that is no longer able to be suppressed. This is an enormous enterprise to which this novel makes a great contribution because it is so well-written. Saracino has managed to put into a compelling story what she learned firsthand when she traveled to Sardinia in 2004—and she has supported that with a mountain of research! Her psychological acuity makes the characters come alive. This novel is the best attempt that comes to mind of weaving together both scholarship and story writing."